A bit of a slow week for Deal Me In, but thanks to Candiss we still have five stories to share. Please take a moment to visit or comment on the Deal Me In participants’ blog posts, or just let “them know you were there” by liking their posts. If I missed anyone, feel free to add a link in the comments. Happy Reading! That’s it for this week. I’ll post another wrap up next Sunday afternoon/evening. 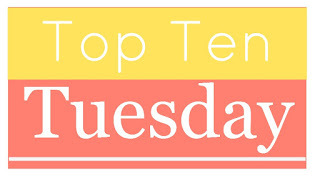 This week’s Top Ten Tuesday (an popular meme hosted by the blog, The Broke and The Bookish) theme was “The Top Ten Characters Who _____” and we are left to fill in the blank. Naturally I went with Top Ten Characters who Died Memorably in George R.R. Martin’s A Song of Ice and Fire series (and its television counterpart, Game of Thrones). 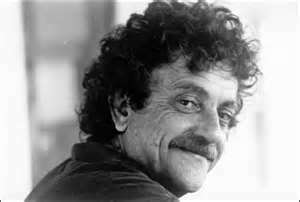 My ground rules for inclusion: the death is significant to the story, shocking, gruesome, or involved a main character. As far as the George R.R. Martin books vs. the HBO Series, I guess I’m using both – mostly the series, though, as it’s fresher in my mind. (They’ve become hopelessly mixed together in my brain anyway) I will say all occur before where we are in the series now, and what the series reflects up to in book three, “A Storm of Swords.” I did notice in my research too that “Access Hollywood” kind if scooped me in this area, but there’s room for everyone on the GoT bandwagon, right? And – do I even need to say it? – MAJOR SPOILER ALERT! How many times has “The Lord of Light” brought him back now? Maybe this should be 11th thru 14th? This is “The Death that Starts it All” and leads to the calamitous events that are still befalling the Stark family and the rest of Westeros. If there was any doubt at the Lannisters being “The Bad Guys” (and there shouldn’t have been at this point), Cersei’s insisting that Ned kill Sansa’s direwolf should have removed them. Setting the standard (and I’m talking more about the series here) for an incredible run of blood gushing, opened throats that will greatly shorten broadcast times when they are removed to make the series suitable for network television. See sentence one of the previous entry. I wanted to rank this one higher, but it bothers me that I liked this scene where young Arya Stark avenges the death of her friend Lommy by using the same words his killer did. Yep. No one was sorry when this happened. Daenerys is free to be her own person (and is now the rightful heir to the Iron Throne) when Viserys suffers a Crassus-like fate at the hands of the Parthians, er, I mean Dothraki. I still wonder what people who hadn’t already read the books thought about this episode. Roose Bolton’s “The Lannisters send their regards” line as he delivers the coup de grace to Robb was one of the most memorable in the series. And Catelyn? What was I saying about opened throats earlier? We get a two-fer with her death, and though Ser Hugh’s might have been best in gruesomeness, Catelyn wins the blood spurting distance category. Did she have high blood pressure? This was a shocker both in the book and the TV series. Appropriately, we first meet Ned when he is beheading a deserter from the Night’s Watch. What goes around comes around? Maybe I’m ranking this number one because it “just happened” (in series broadcast time anyway) or because I hate Joffrey so much. I mean, who are viewers/readers going to focus their hate on now? 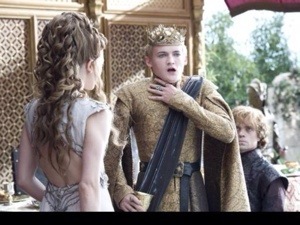 As Joffrey choked and Cersei lamentingly wailed, I kept hearing Jerry Seinfeld’s “That’s a shame…” line in the back of my mind. Are YOU a reader/watcher of these books/this series? Which are in your top ten character deaths? If you’re not, what kind of “top ten characters who ____” did you decide to do? I’ll leave the details for those industrious enough to read the story. I was particularly fond of the last lines of this story, which are quite good and almost goose-bump inducing. A very short story and worth a read. 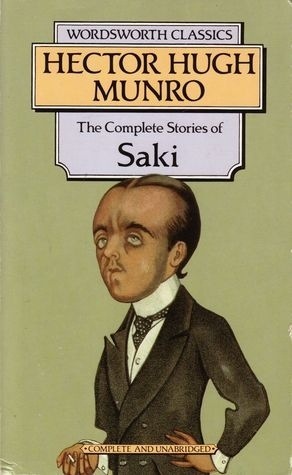 I own a copy of Saki’s collected stories, pictured above, but rather than dig it out, I read this one on line at the link provided above. 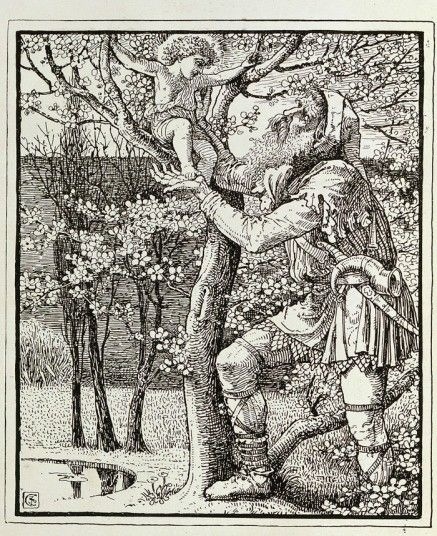 Two other short stories I like to read around Easter are Oscar Wilde’s “The Selfish Giant” and Leo Tolstoy’s “The Three Hermits” (which I also once blogged about here). Both are quite good and are appropriate for the season, I think. Have you read any of these stories? What do you think of Saki’s works? Do you do any special reading around this holiday? 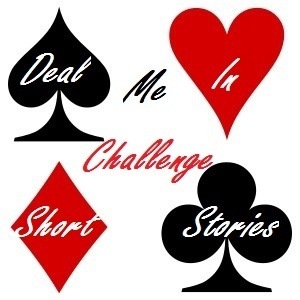 For week 16 of the Deal Me In 2014 Short Story Reading Challenge, I drew the six of spades. 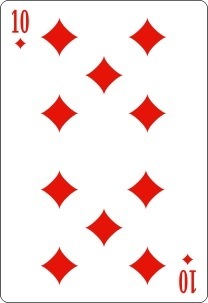 Spades are my suit for “darker” stories and this one certainly qualified. For my complete roster of 2014 click here. Prior years’ rosters are accessible via the links on the left. 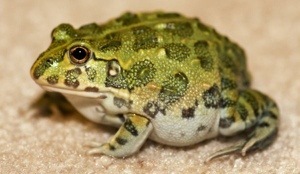 Mr. Bullfrog, a fastidious shopkeeper, finds only somewhat late in life a woman who he feels to be the perfect match for him, and “within a fortnight” the two are wed. All is going well. At first. It is on their “matrimonial jaunt” in a carriage ride, that he discovers he has hitherto only seen one side of his bride. That would be her good side, naturally. Not an overly long or particularly deep story, but I do enjoy Hawthorne’s deft command of the English language, and it is always a pleasure to revisit his work. What about YOU? Have you read this story? What about others by Hawthorne? Which are your favorites among his works? Below are links to the stories I found that are new since last week’s wrap up post. If I’ve missed one, or if you finished after my publishing this, you may share a link in the comments and/or I will include it next week. Until then, happy reading! 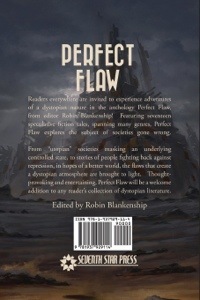 I just recently finished this anthology of Dystopian stories, published by Seventh Star Press and edited by Robin Blankenship. Overall, I found it to be quite strong, liking almost all of the entries, and I highly recommend it if you’re a fan of dystopian literature. Before I began reading, I was perhaps most looking forward to seeing what type of worlds the authors would build in each story. It kind of reminded me of an extended “speed dating” session, but with spending a little longer 30 minutes or so with each dystopia, trying to decide which ones were the most expertly constructed, or most likely to be able to happen somewhere in our actual future. To continue that analogy, however, after this speed dating session, I wanted to explore many of the worlds in more depth and couldn’t easily pick just a few if I were to be charged with that task. In these types of stories, other characters are not necessarily the source of “stress” for the main characters. True, they may be one source, but it is the environment itself which is the primary stressor; this makes for interesting reading, I think. The downside of reading this collection, though, is that these stories are almost universally NOT hopeful stories. “Happy” endings here may just mean that the man character has survived with his life. I.e., I didn’t find myself wishing I was the main character in any of these stories. But that’s what one expects when reading dystopian literature, right? It just means that the authors have done their job well. In Herika Raymer’s story, “Seventh Degree” we learn there is an event in that world’s history known as “The Decay,” from which civilization is still recovering and after which reproduction is strictly regulated. 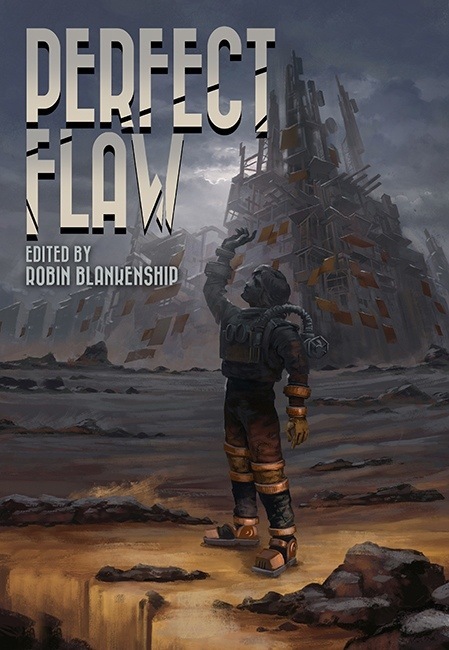 There are the mechanical “Regulators” and “Arbitrators” in one of the best stories, Jason Campagna’s “Hope Unknown.” In the great story “The Bird Below Ground” by S.C. Langgle, time is measured in “P.E.” years. That’s “Post Explosionum” of course. 🙂 Then there’s the mess hall in the story “Cracks in the Concrete” by Frank Roger, where the music is turned up so loud that conversing with one’s fellow citizens is impossible. Raise your voice? They’ll just turn it up even louder. (Kind of reminds me of how I used to deal with the strange noises an old car of mine made.) There are also the Revivologists in the creepy story, “First Head” by H.H. Donnelly, who assist in connecting (literally!) newly unfrozen heads to new bodies. The other thing that was common for most of these stories is that I felt most of the main characters were quite heroic. What could be more heroic than the struggle to retain societal freedoms or even the right to one’s own identity? Maybe the great character Mina in the first story, Cathy Bryant’s “Cost Benefit Analysis,” is representative when she asserts: “Well I wasn’t ground down yet. And I had a plan.” Right on, girl. Fight the power! There’s “The Job Hunter” by Shaun Avery. In the future world of this story, those unfortunate enough to lose their jobs and become unemployed have a limited time to find a new one, and the penalty for failing to do so is, um, extreme to say the least. The story also explores the “change of heart” that the main character undergoes as his perspective changes when he loses his job. He says that formerly “like the rest of the luckily employed, I resented the taxes that I was paying to keep them (the unemployed receiving benefits) in booze.” Even worse is a later passage: “I remember the Head of Government Earth, the day they’d brought in the Unemployment Death Act. We’d all cheered at that, Bill, Chester, Arnold and me. My friends. The guys I’d worked with. Drinking… down at the pub and laughing at the lousy jobless bum counting out his Job Hunt Allowance pennies to pay for the cheapest drink on the menu in the bar. We’d laughed and I’d said, ‘You know, he’d be better off dead,’ and you know something? I’d believed it.” Chilling stuff, yet those sentiments aren’t that far from some of the rhetoric flung around today, are they? There’s “Hope Unknown” by Jason Campagna. Hope is the main character’s name, and she finds herself recently orphaned and being shipped off-world. She and the other girls on the “orphan run” don’t talk much lest they incur the wrath of “Regulator” – a “floating gray-ball shaped robot who administer a nasty shock to unruly little girls.” Hope carries a miniature model of the Statue of Liberty with her, as it is the only thing that belonged to her mother that she has left. Her ‘captors’ try to convince her to give it up. She wonders why they don’t just take it by force since obviously they could: “I know you could’ve taken it from me, but… why do you want me to give it up?” she asks. “It is hard to take freedom from someone who will not surrender it herself,” is her mechanical overseer’s response. Something to think about, no? One story, “The Choosing” by Michael O’Connor has probably the best line in the whole anthology: the two-word “He screamed.” (With its context, of course) that concludes the tale. Though I saw the twist coming, I think O’Connor still pulled it off quite well. There’s the quite disturbing “Your Comfort is Important to Us” by Tanith Korravai. Short but very effective, it seems at the onset to be a very clinical set of instructions for expectant mothers, but it turns darker by degrees, and the more you learn the more you wish you didn’t know. Quite effective. A candidate for my favorite story would be the final one, “The Useless,” by Ellen Brock. Strategically placed at the end of the collection, it ends with an offer of some real hope. The premise is that of a society which literally discards its members who are deemed “useless.” The main character, Ishka, who is physically and mentally impaired as the result of a childhood accident, has reached the age where youths are chosen by one of the society’s “trades” to follow their most suitable career path. Sadly, and at great disappointment to her parents, she is not chosen for anything. She’s useless to “Our Great Nation.” She leaves home but fortunately falls in with some other useless members of society being sheltered in the basement of the city’s undertaker. (The non-useless citizens of the city have always assumed the undertaker is getting rid of them in his incinerator. 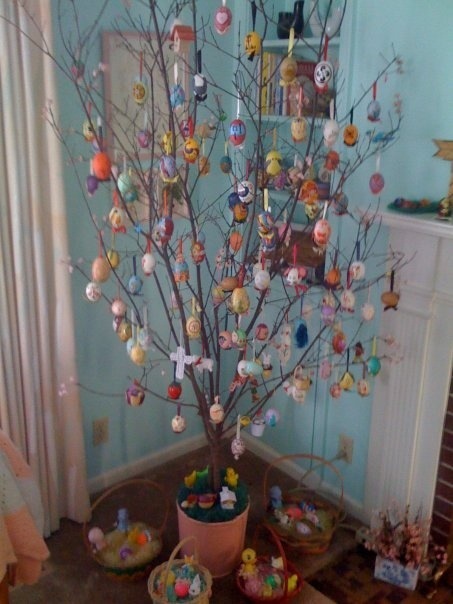 Quite humane, huh?) Things go well for awhile until the undertaker dies and Ishka is forced to rally her limited intelligence to propose an alternative to the incinerator solution when they are discovered by the new, unsympathetic undertaker. Great story. 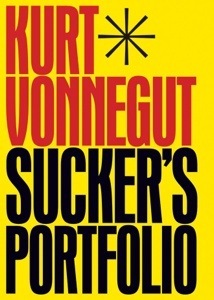 I was lucky enough to learn of it at the time of a $0.99 sale – that’s less than six cents a story for some of these great works. Amazing. 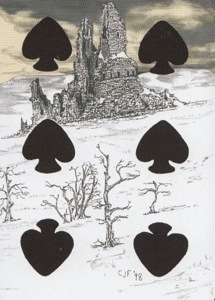 This week for my 2014 Deal Me In Sort Story Reading Challenge I drew the ten of Diamonds, which I had assigned to the Fredrick Marryat story, “The White Wolf of the Hartz Mountains.” Diamonds are my suit for stories recommended by others, and I first learned of this story via Paula Cappa’s excellent blog and its weekly feature “Tuesday’s Tale of Terror” (see here for her post on this story. 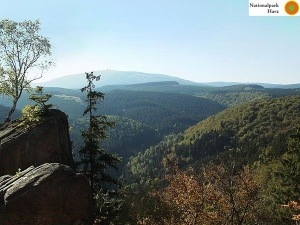 “I take it for granted, that you have heard people speak of the Hartz Mountains,” observed Krantz. It seems Krantz is the only surviving member of a small Transylvanian family whose history has been marked by violent death. 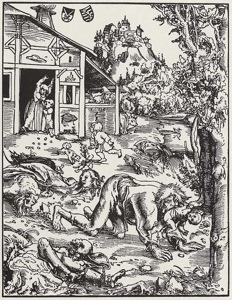 A family whose father murdered the mother, after catching her in an act of infidelity, then fled north to the Hartz Mountains (Germany) of the story’s title. There they live a harsh and lonely existence that settles into routine until, while hunting one day, the father sees and pursues a white she-wolf. Just as he draws a bead on it and is preparing to fire his rifle, however, it mysteriously disappears. On the way back to the family’s cabin, though, he encounters a man and daughter, half-frozen, looking for shelter which he, naturally, offers. The man tells him that they too are fleeing Transylvania “where my daughter’s honour and my life were equally in jeopardy!” As one might expect, Krantz’s father falls for this young girl (Oh, I forgot to mention that she was beautiful 🙂 ) and they eventually marry. 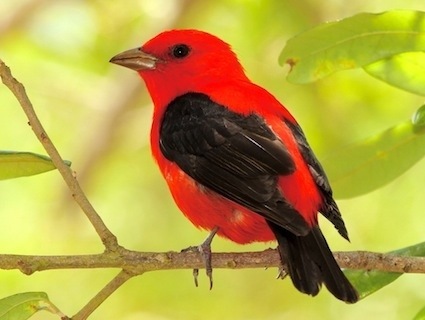 The strange girl’s father, oddly, insists on the vows being exchanged not including the phrase “by heaven” but instead “by all the spirits of the Hartz Mountains.” Reluctantly, the storyteller’s father agrees – but wouldn’t that be a red flag? Anyone? Since I’m providing a link to the text of the story, I won’t reveal the additional events that transpire at and around the cabin, but will say that as a result, Krantz lives under a curse. A curse that includes as part of his fate that “His bones will bleach in the wilderness…” Will he escape it, or will it find him even half way across the world. Why not read the story and find out? 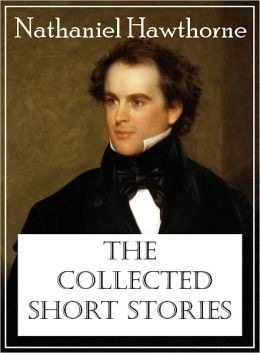 This was the first story I’ve ever read by Fredrick Marryat. I enjoyed the almost fairy tale-like feel that it retained in spite of being somewhat gruesome. 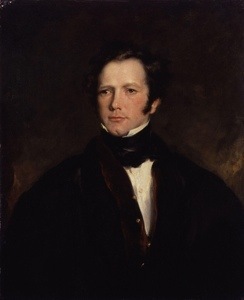 It seems that Marryat was something of a Renaissance Man as well, excelling in many fields (he also invented a flag-based signaling system for seagoing vessels and was in command of the ship the brought the news of Napoleon’s death back to Europe). What about you? Have YOU encountered him in any of your reading? Please consider taking the time to visit the other participants’ posts or even “like” them or leave a comment to share some feedback.